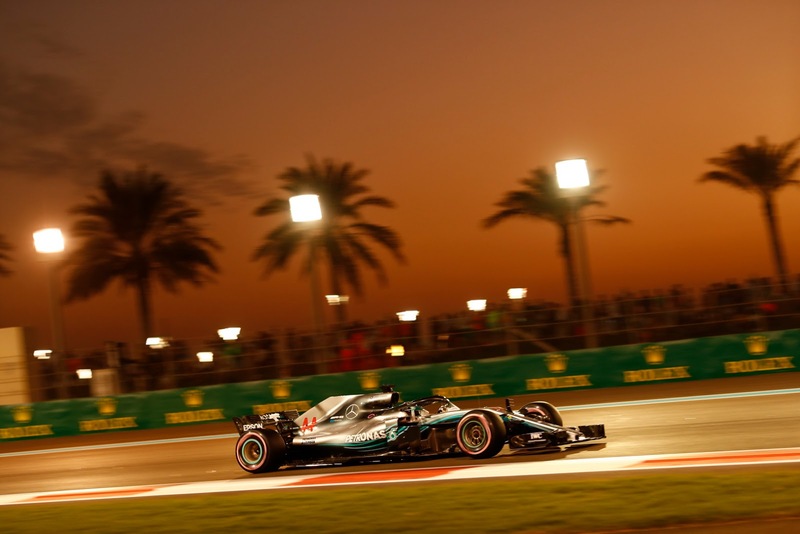 Matt 'Trumpets' Ragsdale gives us the lowdown on the events leading up to and including qualifying for the 2018 Abu Dhabi GP. Onto more controversy, with all but Bottas' defense of P3 from Verstappen settled, Mercedes have announced that indeed they will positively consider running their super trick wheels with their non-aero cooling configuration that might indeed have an aero benefit if you are a Ferrari fan.... Or not, but looking at FP3 times, in particular the S3 times where many competitors melted their rears on quali sims, it would seem that they are ready to brave a protest and go with them. Although with an evening start and lower track temperatures, the times will be faster and the competition closer. Also on point, Raikkonen, who was a tenth up on Vettel, as Sebastian was not happy with his setup as Kimi. Formula B was led by Grosjean and HAAS by nearly half a second as temperatures dropped and the teams made their last minute preparations for the final qualfiying of the 2018 season. Leclerc lit up the board early days, but it was his teammate, Ericsson, trailing behind, who took the final honours from the first, group, fastest through S1. It was Hartley, in S2, and as the times rolled up on the board, it was Gasly and Hartley at the top of the first group of runners. But with Raikkonen a purple dot on the timing screens it was a matter of seconds before he ascended to the top, nearly 1.7 seconds faster with a 1:37.010. 12 minutes to go and Mercedes were out and about, but all eyes were on Vettel, lapping after the Mercedes and taking S1 honours away from his teammate. To the top he went with a 1:36.946, as it was clear that Mercedes were doing multiple prep laps for their tyres. Wasn't enough though, for Mercedes as Hamilton was in with just a P3 and Bottas about 3 tenths back in P4. Not much in it, with just a tenth or so covering the top 3 as Red Bull finally rocked onto the track, with 8 or so minutes left in the session. Despite the problem in FP3, it was Ricciardo just ahead of Verstappen, only hundredths between them but nearly half a second off the top of the field. Formula B was led by Hulkenberg, with Rogro just behind, off by 0.05 seconds and according to Gunther Steiner, balked by traffic. On the outside looking in with 5 minutes left, it was Magnussen, Ericsson, Vandoorne, Sirotkin and Stroll with it all to do, with Alonso on the bubble. As the clock ticked down to 3 minutes, it was Hamilton, back out on a push lap, unusually so for Mercedes. P2, for him, and then Bottas outpointed him as the rear of the car looked loose in the final sectors, a place where overheated tyres will give up their grip. A replay of Kmag's first lap showed him running wide over the kerbs and losing some bodywork from underneath the car, never a good thing. With the checquers flying, Ocon was on it, across the line into P4. Next up was Leclerc P7. Kmag was into P13 with Perez, trailing him, rocking up a P9. Alonso was next with a P14 and Vandoorne wasn't able to do better than P18 as Gasly pulled off, smoke coming from his Honda just as he exited the final turn. Done like a dinner were Hartley, Gasly, Vandoorne, Sirotkin, and Stroll, with Kmag breathing a big sigh of relief. Off they went in search of some Madrooba as the rest turned it around for Q2. And away they went, Hamilton and Bottas leading the parade this time around, trailed by Hulkenberg, Leclerc Ericsson and Ricciardo. All the top teams were running UltraSofts, no surprise really, but Force India as well chose this gambit so fun times for all. The mixture of tyres also led to more than usual jockeying for position. AS the board lit up purple and green with the first push laps, it was Hamilton to the top with a 1:35.693, a new track record and nearly 7 tenths up on Bottas and more than a second faster than Raikkonen. Yikes!!!! With Ferrari owning S1, all that time was coming from the twisty bits of the track. And that was clearly visible as Hamilton was nearly a second faster than Vettel in the last sector alone. Once jaws were removed from floors, it was Ricciardo going P5 and Verstappen P10 (really! ), with Sainz being best of the rest followed by Grosjean. 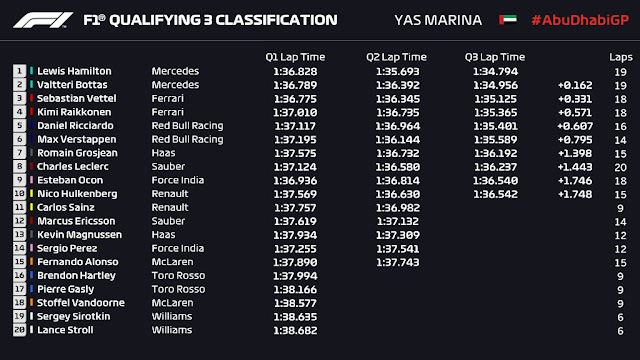 In the danger zone were Magnussen, Ericsson, Ocon, Perez and Alonso, with it all to do as the track fell silent and teams sorted their final adjustment to make the glory that is Q3. Magnussen had a water leak according to Steiner, and as the clock ticked past the 3 minute mark, it was Hamilton leading the way on Hypers, covering off any improvements and prepping for Q3. Leclerc purpled S1 but it was Grosjean ahead of Sainz early days on their last push laps. Leclerc continued to rock up the purples till Vettel got on with a new lap on Ultras. But before he finished, it was Leclerc to P3. Not for long as Vettel slotted in P2, still 0.5 seconds off Hamilton's time though. Verstappen was purpling the board behind, albeit on a set of Hypers and then he was through, but with the strategic wrinkle of starting on the Hypers contra the rest of the sharp end. Ocon was up to P8, with Hulkenberg and Grosean getting it done as well. 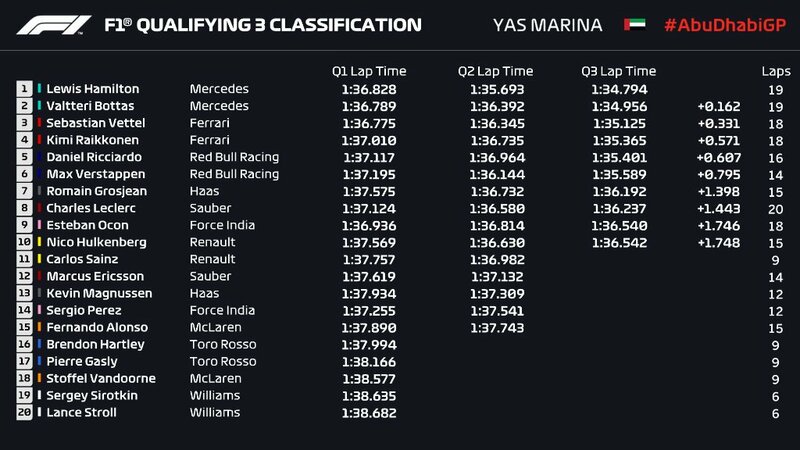 Not so much for Kmag, and with Ricciardo dropping like a stone down the board he was hard on it with a new set of Hypers, till the maths dictated he needed no more as Sainz wasn't able to get it done and he just squeaked through in P10. Off in search of Sulaimani, then, were Sainz, Ericsson, Magnussen, Perez and Alonso, as the rest turned it around for the ultimate playground of Q3. Ocon, Grosjean, and Leclerc were most eager to get on with it, with Mercedes just behind. 9 minutes to go and they were off, Rogro owning S1 early days, as Hamilton went a bit wide into T8 and T9. Again, T14 some twitches but not enough to stop him going P1 with a 1:35.295, with Bottas just a tenth behind. Raikkonen looked strong through the first 2 sectors, but again Ferrari lost so much in the 3rd sector that he wound up P5. Vettel was much stronger, and he went P2, just 0.05 seconds back of Hamilton. Ricciardo had a splendid P4 then Raikkonen and Verstappen. Grosjean went best of the rest, nearly 0.5 seconds up on Hulkenberg. Grosjean, Ocon and Leclerc led the way after the interval, with Mercedes again just behind them. Hulkenberg and Ricciardo followed by Verstappen were the next group on track and it was Ferrari, waiting till the last possible second before rocking out of the pitlane. A minute to go when Grosjean hit the line and then it was Hamilton, across the line with 50 seconds left in the session. As the lap rolled on it was Vettel behind who purpled S1 just as Hamilton was doing the same in S3 and then across the line for a 1:34.795 with Bottas behind rocking up just 0.15 back in P2 as Vettel was entering S3. Again, it was a massive bleeding of time for the Ferrari in the last sector and P3 with a 1:35.125 was the best the Scuderia could do. Raikkonen was 2 tenths back and then Ricciardo and Verstappen with Grosjean taking the Formula B palmares for the last time in 2018. Tomorrow's race is full of interest then, as Verstappen on the faster tyres will no doubt seek to make hay at the start, when the others should be most vulnerable in the opening laps and try to steal P3 from Bottas in the WDC. In the midfield, similar hijinks are no doubt planned as those out of the top 10 will seek to make maximum use of their tyre choice to confuzzle those starting on the quick degrading hypers. The stakes are a bit higher in the WDC as well, with Magnussen 3 points adrift of Perez for P8, Ocon a single point off Alonso for P10 and Grosjean just 2 up on Leclerc for P13 (admittedly, I may be stretching here). At any rate, it's the last race in the season so just go enjoy the darn thing for once!! !